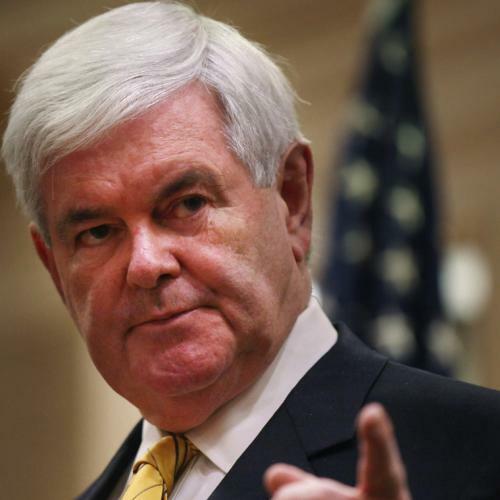 On shady book deals: In the late 1980s, Gingrich launched a vicious attack on Democratic Speaker Jim Wright, arguing that bulk sales of his book had been crafted to avoid laws limiting outside income for members of Congress. By the mid-90s, however, Gingrich found himself in a strikingly similar position, as it came to light that he had received a $4.5 million advance from HarperCollins in a two-book deal. Then, in the spirit of one doing one better, it later came out that one of Gingrich’s charities had bought the books en masse. On the housing crisis: In the Bloomberg-Washington Post debate, Newt called, with a straight face, for the jailing of Chris Dodd and Barney Frank: “In Barney Frank’s case,” he advised, “go back and look at the lobbyists he was close to at—at Freddie Mac. … Everybody in the media who wants to go after the business community ought to start by going after the politicians who have been at the heart of the sickness which is weakening this country.” All that rage at lobbyists for the housing agencies … from a man whom Freddie Mac paid between $1.6 and $1.8 million for his “advice as a historian.” Which definitely isn’t lobbying, and would never qualify as the sort of relationship that he just suggested was worthy of being jailed for. On drug policy: As a good child of the ’60s, Newt smoked pot, and as a young congressman in 1981, he authored a bill to legalize the use of marijuana for medical purposes. But Gingrich’s more recent stated methods for dealing with drug offenders might have placed his younger self in a tight spot. Just last week, he argued that when it comes to dealing with illegal drugs, “Places like Singapore have been the most successful at doing that,” ostensibly endorsing the idea that anyone caught with 18 ounces of cannabis face mandatory death by hanging. On corruption: Newt led Republicans to power in 1994 in part by blasting Democrats as being hopelessly corrupt. But soon after, Gingrich engaged in his own congressional corruption, getting slammed by the House Ethics Committee on a multitude of charges: of laundering donations through charities, of using a charity called “Learning for Earning” to pay the salary of a staffer writing a Newt Gingrich biography, and of lying to the ethics committee. Gingrich eventually had to pay a $300,000 fine for his transgressions. Thomas Stackpole, Darius Tahir, and Jarad Vary are interns at The New Republic.